Sarah Palin has a new gig, in addition to full-time warrior for Christmas: The Hollywood Reporter says she's getting her own show on the Sportsman Channel. Titled Amazing America with Sarah Palin and set to debut in April, the show is "an anthology of stories that explore some of the most original, interesting – and sometimes inspiring – people, places and pastimes connected to America's outdoors lifestyle." For those of you who've never had an entire (distant) branch of the family turn up to Thanksgiving Dinner dressed entirely in camouflage, the Sportsman Channel is mostly excruciatingly boring shows about hunting and fishing. Amazing America is part of a new programming plan dubbed "Red, Wild & Blue America"; We assume Ted Nugent has also been courted. 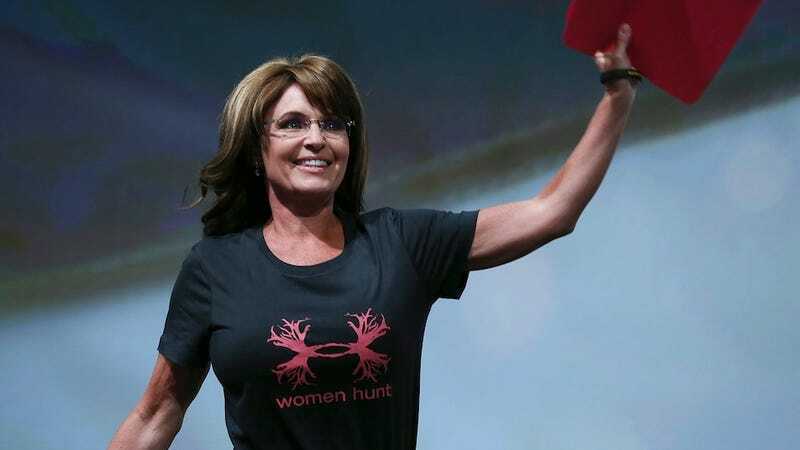 Congrats to Ms. Palin, for she is finally living out her truest, best destiny.